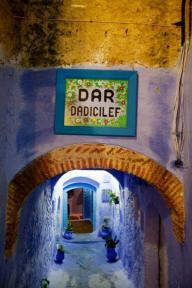 Dar Dadicilef, whose name means happiness ('FELICIDAD' spelled backwards),is one of the oldest andalusian houses in chefchaouen. The dar (house) is perfectly located in the heart of the medina (old city), in a neighborhood called 'Suika' which was the historical centre of commerce. -The main square 'OUTA HAMAM'. -Biweekly FARMERS MARKET held on Mondays and Thursdays. 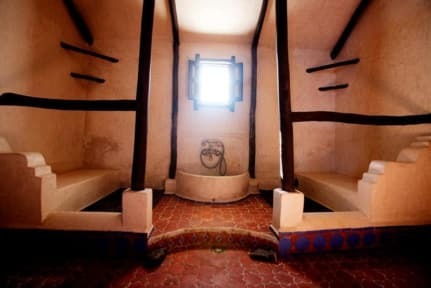 -Traditional HAMMAM 'BLAD', remnant of the 15th century. -Good and cheap RESTAURANTS with terrace balconies. -'RAS EL MAA' (the medina's natural water source). Welcome to our quaint establishment. We're just a stone's throw from the main gate of the medina 'Bab El Ain'. Once you get inside DAR DADICILEF you will definitely sense the totally laid-back, Chilled out and cozy atmosphere. The outdoor garden area is just superb for lounging around and catching up with other travelers in the evening. We are in hand to assist you in making your stay an enjoyable and memorable one, whether you are going out or staying in. I had such an incredible experience at Dar Dadicilef that I ended up staying an extra night. Obviously Chefchaouen is a beautiful and tranquil city, but my stay at the hostel really made the trip. They were so sweet and hospitable and really went out of their way to make sure people enjoyed their stay in the city. They recommended some great places to check out and I enjoyed every recommendation. Recommended! Nice stuff, nice place to stay at. Very cute, clean, easy & relax, comfort, homely stay. Location was good and easy to locate. The Son and Father very kind and you get to save Morocco mint green tea anytime you asked for it and breakfast was good. The Son can speak a very good English and give me a information what to see and where to eat. I love this lovely hostel definitely will stay here again. Thank you for the hospitality and good job. Such a wonderful hostel! I wouldn't have wanted to stay anywhere else in Chefchaouen. Abdou and Ahmed are so kind and welcoming to guests, the breakfast is amazing, the environment so cozy, and the place is so clean. It was a great place to come and rest after a day of trekking around the city. Would definitely stay here again! This was one of the highlights of my time in Morocco. It was an incredible experience to be able to stay in such a beautiful home with very friendly hosts. I couldn't be happier and will definitely come back. Amazing place! Helpful staff, clean place and delicious breakfast are the strong points of this nice hostel. I am really confortable to recommend it to my best friends and all the people who want to enjoy Chefchaouen. Amazing experience in this hostel. Abdul and his father Ahmad were really great hosts. They made us feel at home. Mr Ahmad would get the fire running in the lounge area every night and keep the guest warm while enjoying Moroccan tea and mingling with other travellers. Breakfast was amazing as well. The room was also perfect. A little cold but it did not affect the joy we had staying there. Kudos to Abdul and Mr. Ahmad. Great job. Will definitely stay here again if we have the chance. Peaceful blue, traditional riad. Great atmosphere when gathering around the fireplace. Which helps in winter! Great stay. Clean hostel. Very friendly and accommodating staff. Breakfast is nice. Near the street so not very quiet but not too loud. Needed to stay an extra night and staff was very helpful. Would recommend.